Raising tadpoles allows children to learn about the life cycle, metamorphosis and their connection to the natural world. 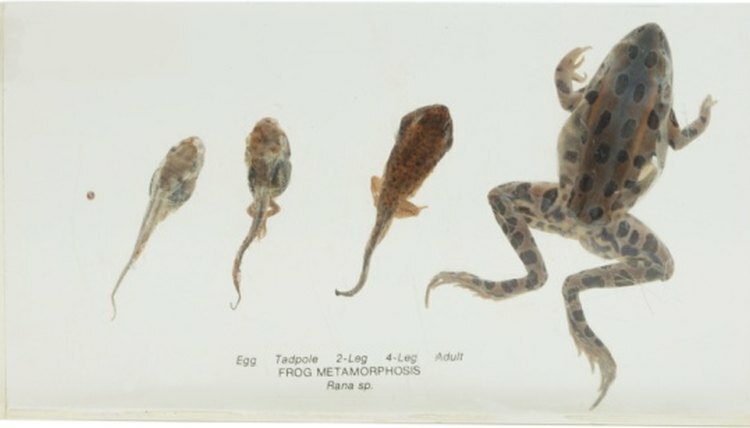 The length of time until the tadpoles metamorphose into frogs depends on the species of tadpole. Some species will change in as few as six weeks, but others, such as the American bullfrog, remain a tadpole for up to three years. Raising tadpoles requires research, commitment and preparation, but the payoff can be worth the effort. Find a suitable container. Containers should be plastic, glass or foam. They should be clean, and they should never have held any chemicals or cleaners. The container should be long and short to maximize the surface area between the water and the air. Sizes range from small aquariums to kiddie pools. Find a suitable location. The container should be placed on a solid surface where it will not be bumped or disturbed. The container should be in approximately 75 percent shade and 25 percent sunlight. The area should be warm, because cool water will slow the metamorphosis. Acquire water and fill your container. The ideal water is rainwater that is not run-off. If you choose to use fresh groundwater, be certain it is not polluted and boil it to remove any diseases. De-chlorinated tap water is acceptable if the other choices are not available, but it should be sealed in a container for five days prior to use to age it. Save some water to use to refresh the container. Add sand or gravel, if desired. Covering the bottom of the container is not necessary, but it will stimulate and entertain the tadpoles. Add an oxygen source. You can use underwater plants or an aquarium aerator. The plants obscure your view, but the tadpoles may enjoy having hiding spots. The aerator should be on a low setting, and it should not be used if your tadpoles were found in still water. Acquire tadpoles. Some pet stores sell tadpoles, so you know exactly what to expect. It is illegal to gather frogs or frog eggs in some states, and you need a fishing and wildlife license in other states. After research and permitting, you might choose to find eggs in ponds, rivers or other freshwater sources. Tadpoles may be as dense as you like, but once they metamorphose, there must be 1 liter of water per frog. Feed your tadpoles. Tadpoles mostly eat algae and greens. Steamed or frozen lettuce or spinach are the best food sources for container tadpoles. You may also use store bought algae, algae wafers and commercial fish foods to supplement their diets. Tadpoles should be fed twice a day and any food not eaten in one hour should be removed from the tank. Clean the water. When the tank gets murky or cloudy, scoop out some of the water and replace it with clean water. A small net may facilitate this process. The proportion of water needing changed depends on the clarity of the starting water. Add climbing materials when your tadpoles grow their legs. Sticks, ledges and floating plants allow your juvenile frogs to exercise and try out their new limbs. Change their diets. When tadpoles begin to change and breathe air, their diet becomes carnivorous. Feed them small insects from the pet store. Crickets and bloodworms are the best. Release your frogs, if necessary or desired. In some states, it is illegal to keep pet frogs, so they must be released within a certain time frame after metamorphosis. Some states will not permit you to release them if they are not a native species. Other states do not allow their release at all. Research your state to know what you must do. If you do not know a food or plant's origin, do not put it in your container. Thoroughly research all state and local laws before beginning to raise tadpoles. Some plants, such as oleanders and pine trees, are toxic to tadpoles and frogs. Salt is also toxic. Do not touch the tadpoles. They are very sensitive and the bacteria on your hands can be detrimental. Wash your hands after doing anything with the container or the tadpoles. Born and raised in West Virginia, Megan Hippler has been writing environmental articles since 2008. Her work has appeared on the websites of various state government departments. Hippler has a Bachelor of Arts in environmental studies from Hollins University.